I live at the Petit Chalet in the "lake district" of Seattle...perhaps you've heard of it? It's one of the smallest wooden dwellings in the state of Washington...but surrounded, thanks to a huge yard, with flowering scented plants of all kinds from around the globe. The closest I've come to a linden tree was a huge honey locust tree (cut down last year because of dangerous old age; I'm still in mourning). I love the scent of linden blossom and there are plenty of linden blossom perfumes out there ripe for the choosing: Kerosene Pretty Machine, Frau Tonis Parfum Linde Berlin No. 10, Parfum d'Orsay Tilleul and Tilleul pour la nuit. Grand Chalet has competition! Grand Chalet starts with a beautiful, realistic linden blossom aroma: lush and honeyed, but still having an air of innocence. As the perfume wears on skin, the linden deepens, becomes "milky" and has a mildly woody (almost musky) after-scent that does not compete with or overshadow the linden. I don't like linden blossom in small doses or showing up in a cameo role in a complex fragrance; I like linden blossom as the star, an enduring star. I'd classify Grand Chalet as a soliflore. Grand Chalet wears lighter (a few hours of strong scent followed by hours of close-to-the-body sillage) than some of the linden blossom perfumes mentioned above. Grand Chalet never becomes soapy/clean. I currently own the Frau Tonis Parfum Linde Berlin No. 10 and Parfum d'Orsay Tilleul pour la nuit, but the next time I need a linden blossom perfume, Grand Chalet is on the top of the list. Also, two ceramics collections are available at Astier de Villatte created with the Grand Chalet in mind: the Grand Chalet ceramics collection and the Setsuko collection — both made in collaboration with Balthus' wife Setsuko Klossowska de Rola who still lives at the Grand Chalet. 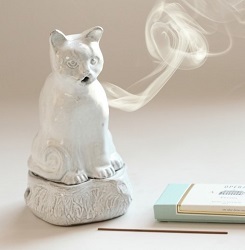 (I would not say 'no' to a gift of the Setsuko cat incense burner.) For more information on the Grand Chalet, see the Fondation Balthus website. An incredible, euphoric scent of wild plants and medicinal herbs. A concentrate of the warm aromatic emanations of woods, the spicy smell of clove and wormwood, the fresh notes of lavender and petit grain, the formula for this elixir is inspired by a very ancient and invigorating recipe. Its herbal trail is long-lasting. Elixir du Dr. Flair opens with the zingy mentholated scent of eucalyptus and ice-cold cloves; its fragrance is a mix of medicated-lotion, muscle-soak and Noxema aromas. This perfume will shake you awake and cool you off on a sweltering day, and it would make an excellent (high-end) sport fragrance to wear year-round. Wearing Elixir du Dr. Flair makes me feel clean and fresh, without a hint of the laundry room. 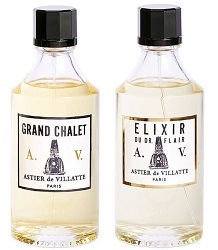 If the aromas of camphor, artemisia, eucalyptus, menthol are off-putting to you, I bet you'll dislike Elixir du Dr. Flair. This perfume is a true Eau de Cologne: it disappears on my skin in a few hours. Note: top image of the Grand Chalet via Wikimedia Commons; Astier de Villatte Setsuko cat incense burner image via Catbird. How funny! I impulse bought a pack of AdV Aoyama incense yesterday in a local store and was wonderfully impressed. Now I can’t wait to try the colognes. Coumarin, the incense and candles are great…hope you enjoy the colognes. 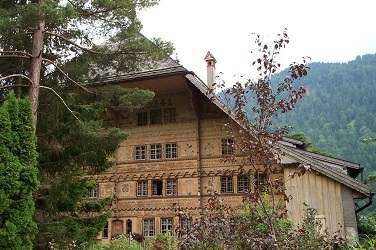 This post almost made me groan with longing – for life in a mountain chalet, the linden perfume and the cat incense burner. I will have to settle for my much-thumbed copy of Taschen’s Alpine Interiors and try and track Grand Chalet down. The price seems okay, too. Kanuka…ah, will look up the Alpine book…love those great Taschen picture books. I have a sample of Grand Chalet and it’s just lovely. Great reviews of AdV, Kevin. I like them all very much – it’s quite a dilemma! And now – that cat! Noz, wonderful clip!! I would love to have that cat smoking here at home. Hi Kevin, we got to spend two weeks in Germany recently and one of the highlights ( for me, anyway) was that there were several linden trees in full bloom right next to our little hotel. They smelled heavenly. I have yet to smell a good perfume version (didn’t like the Tauer version AT ALL. But Grand Chalet sounds very nice. Sapphire, nothing like a real linden tree in bloom…heaven. Am paying attention, Kevin, and will check out all of them next time I go to NYC. donnie: save prime arm real estate for Eau Chic…my favorite! Grand Chalet sounds perfectly gorgeous! I love linden blossoms. We saw a huge old one in bloom a few weeks ago when I was visiting my parents. Just lovely. I have a few other linden-y fragrances, so I don’t need more. But I may have to hunt down a large decant of this one. Anns, those really old trees seem to have more intense scent, don’t they? Really nice review, Kevin. Grand Chalet sounds gorgeous. And that kitty incense burner is so cute. My husband just bought me the Kitty incense burner from Shoyedo for xmas this year. It’s a little Japanese kitty with orange spots and the incense smoke comes out of its ears. Sajini…sounds cute…of course I will do a search now! Ha!